My recent trip to Thailand gave me a lot of memories that I hope would be a start of my journey exploring the city. My boyfriend is right when he told me that I would gain love to the place, because according to him “…because you love to write. Then Thailand is perfect for you.” I love sharing my experience thru writing, and I always find happiness whenever someone is messaging me about my story or a random reader leaving their comments on my posts. As part of my Thailand trip, I would like to share you this hotel that I’ve stayed for my 1st night in Bangkok. 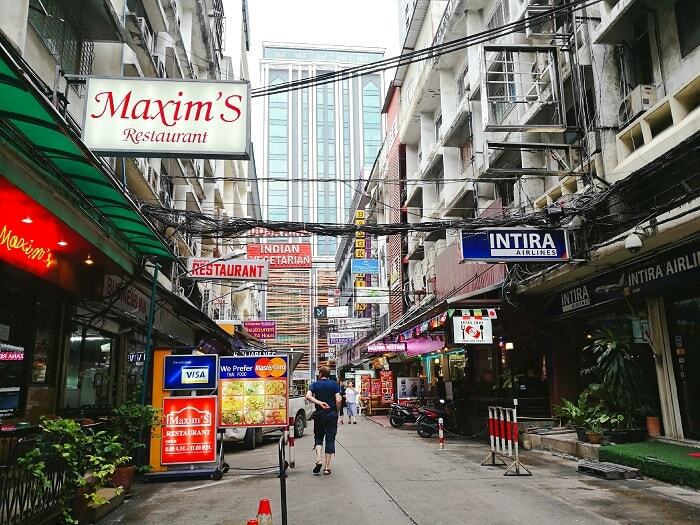 Mon Amour and I decided to stay in Sukhumvit as a starting place to explore the city. But since he have a prior engagement in Chiang Mai two days prior, I decided to have an overnight stay at Armoni Hotel Sukhumvit 11 and change the hotel the following day, as originally planned. I arrived in the hotel straight from the airport at around 1:00PM, quite early for their check-in time of 2PM. I am glad that I book a GRAB for my car and dropped me off at the front of this hotel. At first, I felt quite confused because the hotel sign is quite not visible (I can’t blame them because it’s neighboring businesses seems over shadowing its hotel signage). Turns out the hotel is just a few walks to the main Sukhumvit Road, so I felt the relieve. Upon arriving to the hotel, a Thai lady greeted me politely and gave her my hotel confirmation paper, plus my passport. Gladly, she allowed me to check-in early (at first she thought I was a Chinese girl... I smiled and told her that I can only understand few Mandarin phrases. When she learned I'm from the Philippines, she grinned and said "... I love Cebu!"). She also asked me for a deposit fee in case of incidental expenses (which is pretty normal). Don’t worry the hotel staffs can speak English and Mandarin (but they appreciate it if you can speak Thai). 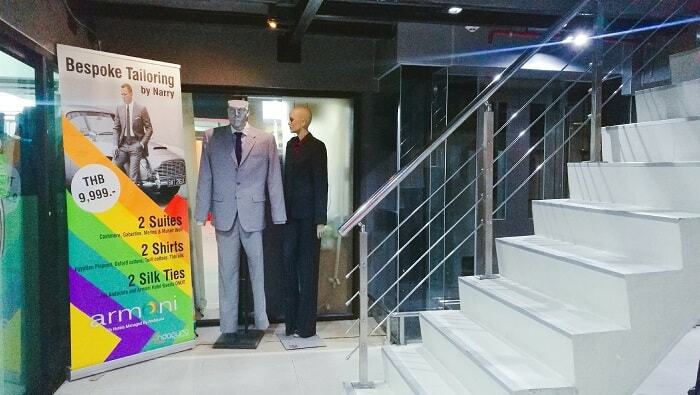 Inside the hotel, you will see this tailoring shop next door (I guess they are renting the place), so if you need an emergency suit, then this shop can hook you up. The hotel have 5-floors, and the smoking area is located on the top most floor. I didn’t bother to go up because I am not a smoker. 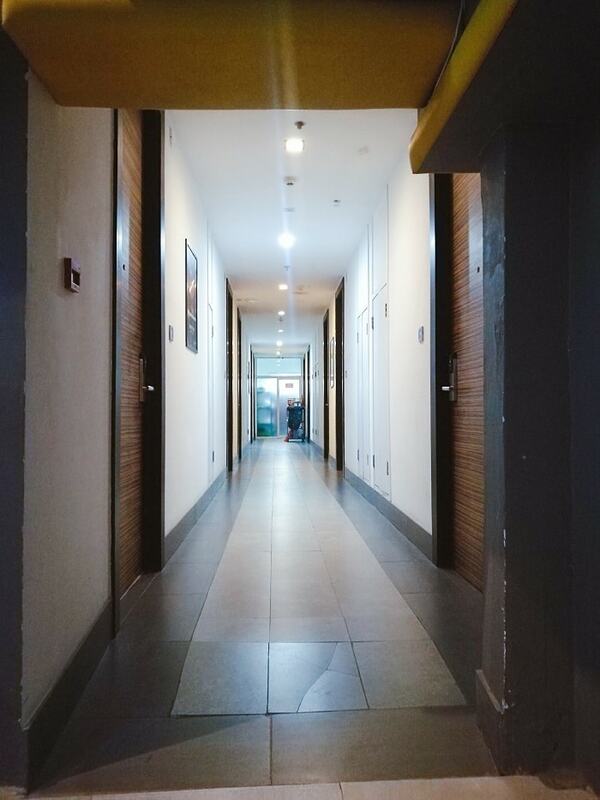 Hotel’s hallway – this floor is where my room is located, 4th floor. Although this hotel is quite small, their room is quite trendy, very clean, and spacious enough for me as a single occupant, but this would be feeling small if my boyfriend is with me. I like their huge bed and comfortable, clean duvet and soft pillows. The air conditioner is functioning well, no carpet but it’s okay the floor is tidy. There is a chair and a mirror on its wall, then a flat-screen television with decent cable channel. They also gave me a complimentary bottle of water (take note – it’s not in a plastic bottle water! 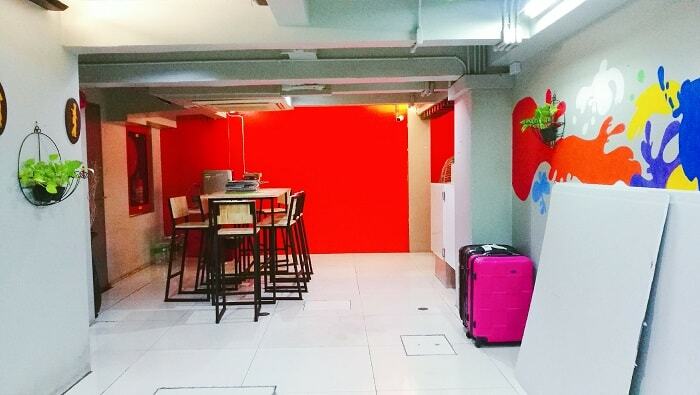 ), complimentary coffee and tea and few snacks. The room also have a mini fridge where I can store some of my drinks, etc. It also contains other drinks for a fee. Although they have a decent cabinet space for my clothes, I didn’t bother unpacking because I will be staying just for a night. The bathroom is separated with a glass semi-tinted door which is pretty cool. There is no bathtub however it has a decent shower with hot and cold water. 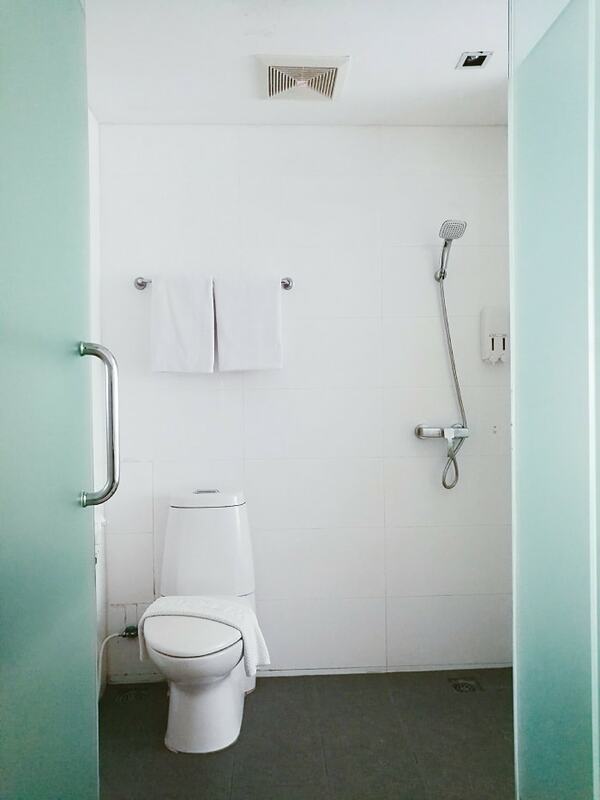 The bathroom is very upfront, but doesn’t bother me and don’t expect a lot considering the cost of this hotel which is pretty cheap for overnight stay (as of this writing it is Php1,200 to 1,700 per night, depends on the season). They also have refillable bath products, which is a trend now in Thailand. They also gave me clean towels for my whole stay. 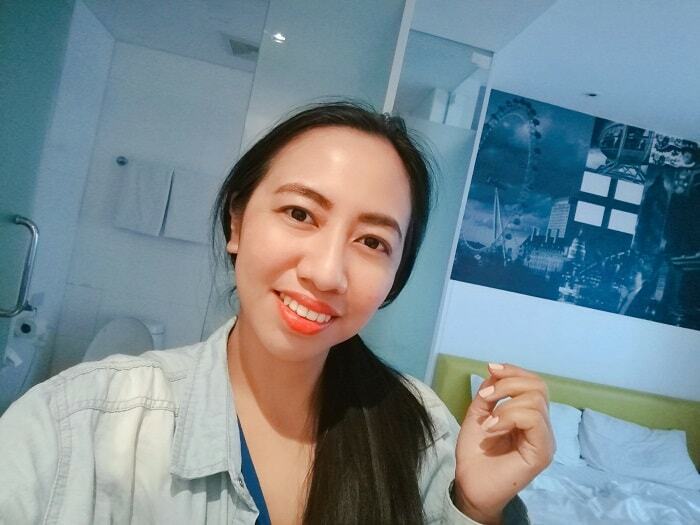 The accommodation doesn’t comes with breakfast and I don’t think if they offer lunch and dinner as well, but it doesn’t matter because the hotel is just a few walks away to many restaurants or decent fast food chains, and grocery stores. I settled in and had a great nap and woke up at 4PM for an afternoon walk to Terminal 21. The next morning, I check-out at 12noon and decided to have lunch and visited the nearest park. But I leave my luggage at their custody (with no charges!) and picked it up at 4PM and check-in to our next hotel for the weekend. 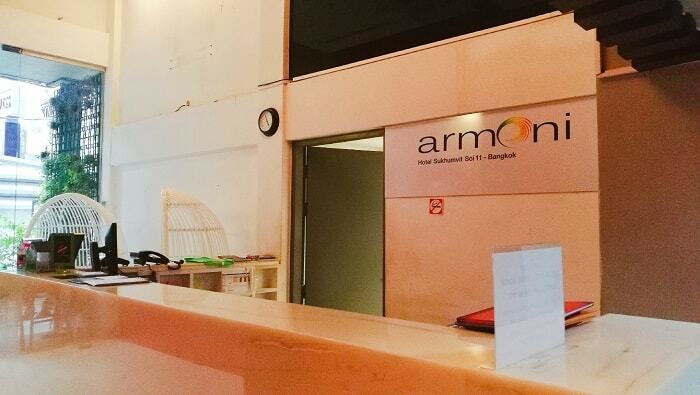 The Armoni Hotel Sukhumvit 11 is a trendy and affordable hotel that I recommend you to try when you are visiting Bangkok. 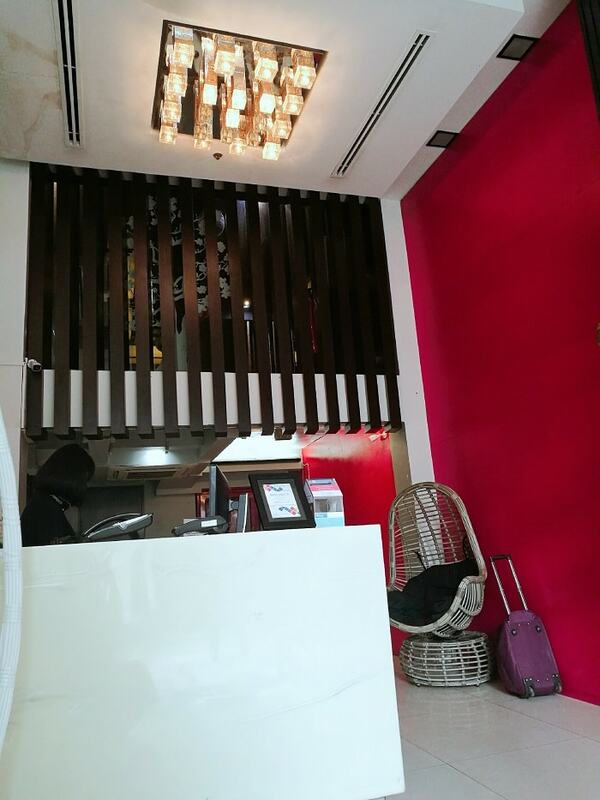 The staffs are very polite and accommodating, plus I never encountered any issues while staying with them. The neighborhood is quite cool as well, with nearby spas and restaurants. Recommendation and definitely I will come back! If you want to search more BANGKOK Hotels for your next trip, then I recommend you to visit our link here. Such great pictures! It looks like a really unique little place! 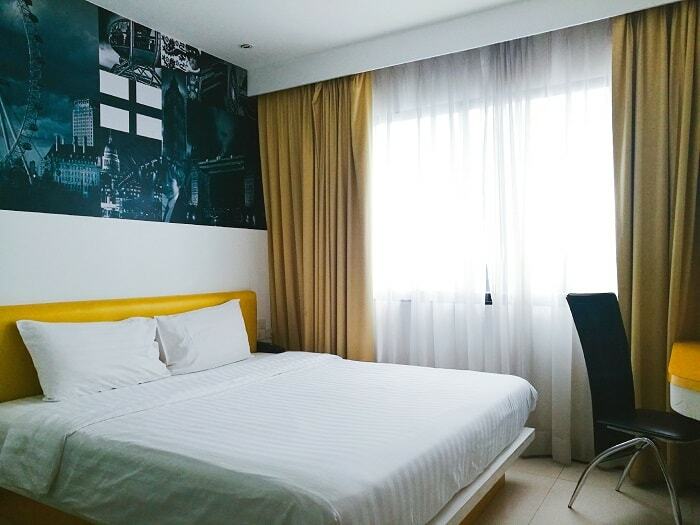 The room is humble looking and safe, and I didn't mind leaving my things inside my room, and they have safety deposit box in my room in case I want to lock my important things. Wow, really looks like a great time! I am not really a traveler, but love to read about other people’s adventures. Oh hope you can travel soon Melissa! Loving the retro tiles in the bathroom, but my favourite thing you pointed out here? The glass water bottles, YES Thailand! THINK OF THE TURTLES! That's true! I think Thailand is the first in Asia who are active in promoting eco-friendly business, and ban single use plastics. Oh this place looks fun! I love the colours in the bathroom! it looks like it's great for what you need! Yeah, they offer no luxury only basics but very comfortable. I have been hearing great things about this destination. I have never really thought about visiting the area before but now it seems like I have to see it for myself! Sukhumvit is more of an expat place, with lots of night life as well. This hotel looks great! Very simple and everything you need! I would definitely keep this place in mind for future trips, thanks for sharing! The hotel looks lovely! Simple and cozy, I am all into it! I agree. This is perfect for short-term stay and the bed is very comfortable too. This looks like a great place to stay! I love how comfortable that bed looks! From the pictures this hotel really looked comfy. If I every plan to travel there I will try to book this hotel. Your review for this hotel is really helpful here. And its cheap! Cheaper than traveler's hotel here in Manila. Thailand is on my bucket list! Looks like you stayed in a great place where you could explore! Yes! I didn't book a more upscale hotel because I knew that I will be outside exploring the whole day and will only go back to my room just to sleep. This hotel is awesome! This looks like a nice hotel in the heart of the city. I love those tiles in the bathroom! It's nice to have something comfortable so close to a lot of things to do. I love the interior design of this hotel its simplicity and minimalist idea is outstanding. I can't say any bad thing about this hotel, for me it's a great deal to check here when in Thailand. It was so nice of them when I can leave my luggage with them (with no charge!) after my check-out so I can conveniently roam around the city. Definitely I will comeback to this hotel. The hotel looks very basic yet very comfortable. I guess the best part is the location. It is so close to Nana BTS, thus makes the whole city accessible mostly. Hope you are had a great time in Bangkok. yes it is. It was so great to be staying near to the station! Awesome for solo travelers as well. I'm not comfortable on staying to cheap places like inns where only bunk beds and sharing rooms because I am very concern about my privacy, and this hotel is incredibly amazing. The hotel looks modest but very comfortable and just everything what needed. I liked the colors in the bathroom and that it has a good location. Would definately go there. Those tiles are so cute indeed! Looks like a great hotel to stay at! Moreover they’re eco friendly so would definitely be one of my first choices! That's true. That time I don't need excesses and just enjoy a comfy bed. Great review and the hotel looks clean and comfortable. 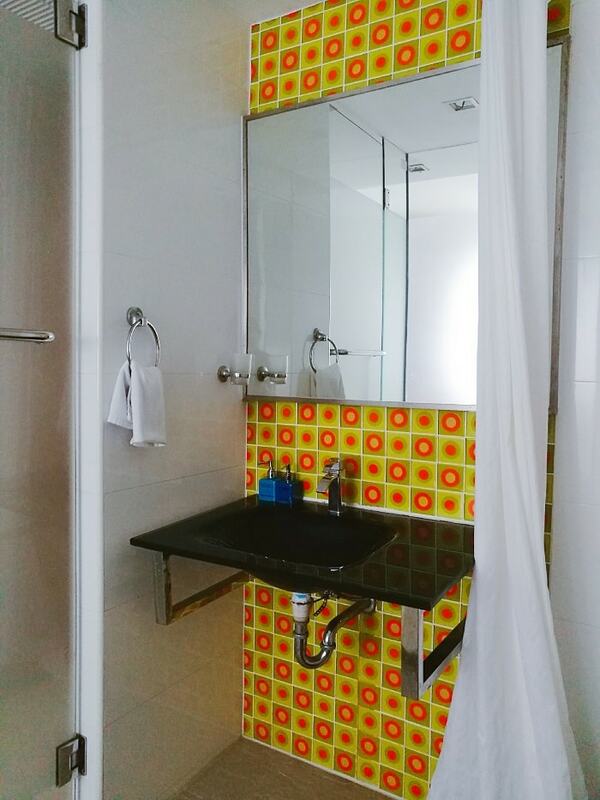 Love the tiles in the bathroom for a pop of colour. I never worry about breakfast not being included in hotel rates in South East Asia as I prefer to eat out anyway as there is soooo much food to try every corner you turn. I know right?! I had this plan not to take a hotel breakfast in order for me to try the local foods outside (but I ended up having a quick breakfast in McCafe because Thai restaurants are not yet open early) and I have a very long day exploring the city for myself and for my blog. Another post, another great recommendation, Blaire. The hotel looks lovely like always and I would definitely want to visit someday. The neighborhood looks really charming too. Thank you for visiting Daniel. You'll definitely like this hotel and the neighborhood, and things get so exciting during at night. 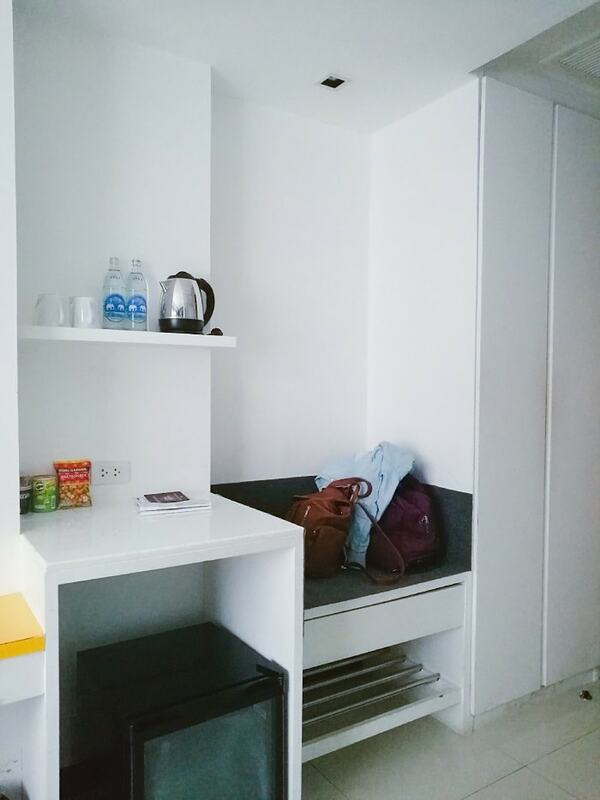 Is good to know that you were not afraid to leave your things inside the room.It looks humble but clean ! I like the simple design of the hotel. Looks like you really enjoyed yourself! Thanks for the recommendation. Yes, it was a comfortable hotel and the staffs are very nice as well. 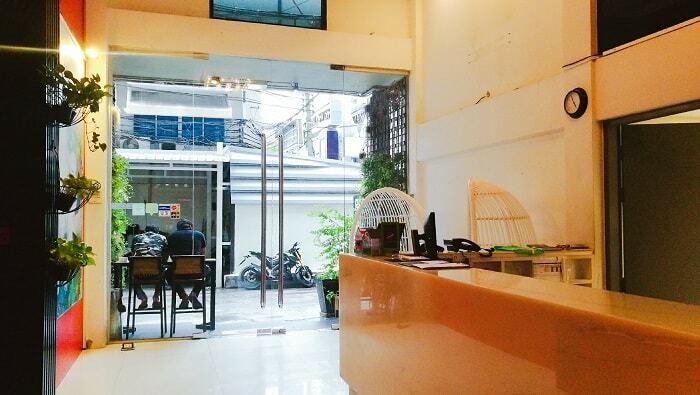 I have visited Bangkok several times and always stayed in Sukhumvit as I feel this is the best place to stay . Your hotel seems to be very practical and not flashy with a good location. 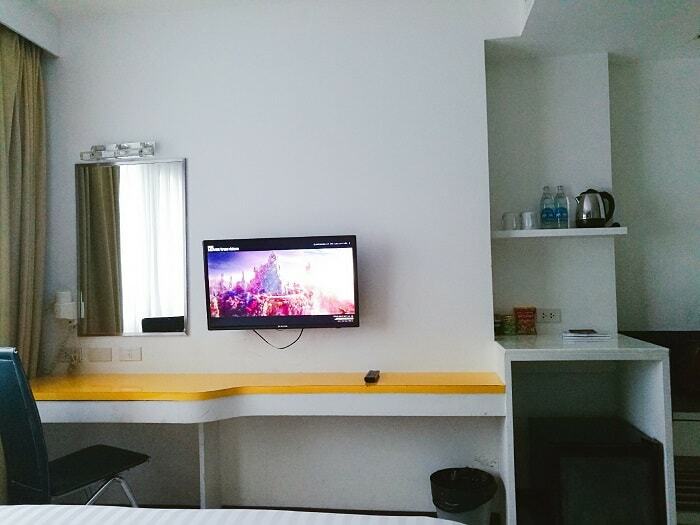 The rooms look clean and modern and good hospitality must say . 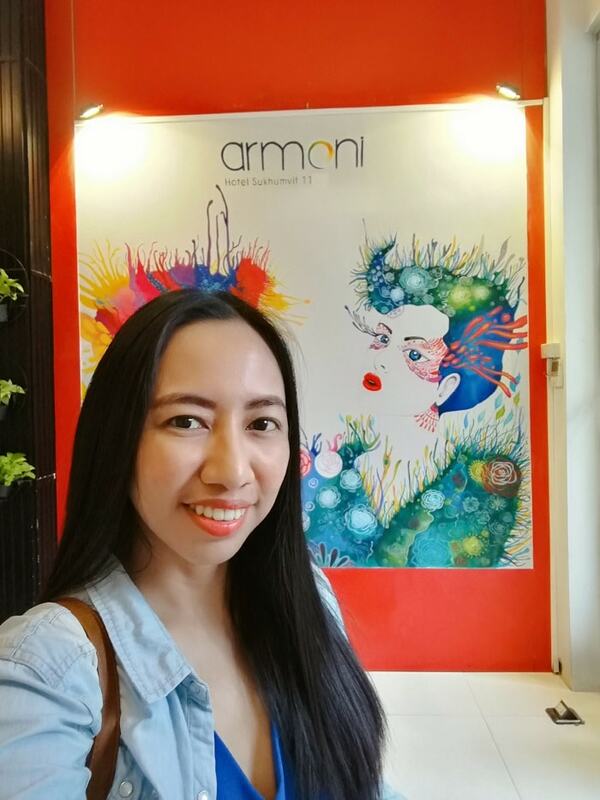 Overall a reat place to live in bangkok and The Armoni Hotel Sukhumvit 11 is a trendy and affordable hotel I must agree with you. I agree Sukhumvit is a place best for newbie like me, and it is accessible to everything. Glad you like it as well! Thanks for the article. I am heading to Bangkok soon and I am looking for accommodation. I know this area and it gives me the chance to check another hotel out. I enjoy staying in this area it is great for shopping and has some excellent restaurants. Yes and it is near the BTS Station at Terminal 21 and Nana. I am sure as Bangkok is huge, it can be confusing finding a suitable hotel for each ones needs. It is always good to be able to read recommendations and reviews. This looks like a fine, basic hotel. What caught my eye was the flag on the bedroom wall. It almost looks a flag of Finland. Do you know what was the meaning of it? wow you got an eagle eye, Paula! I'm not sure what it means but maybe it means you must visit soon! the room looks clean and very comfy.. I would to stay in this hotel when I visit Thailand. Thailand is a very beautiful country that i have had the opportunity to visit twice. I think we stayed close to Sukhumvit road! That road is the most convenient because it is accessible to BTS Station. You always have such great reviews on places to stay. Again, you did not disappoint. I have stayed here before and it is a nice little place. Nothing fancy but still quite good. This trip look amazing. It's on our travel bucket list for sure! Yes and now it is done. Time to looks for another adventure to recommend! This place looks so refreshing! 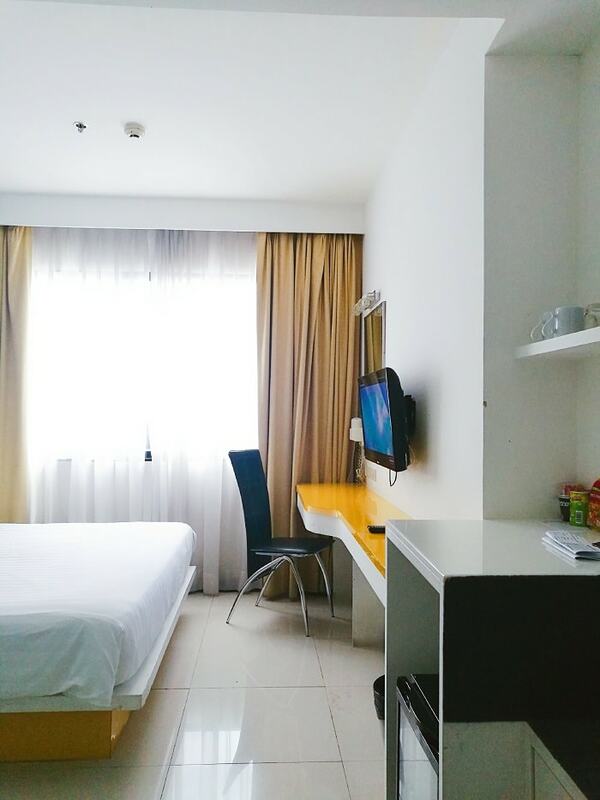 It seems like a perfect getaway to relax in after a long day exploring the busy capital. Thank you for sharing this suggestion. Though they don't have a pool and breakfast, its okay because there are lots of things to do outside the hotel, and good food! This looks like a good choice for a hotel there, especially if on a budget. It's a shame they don't serve breakfast, but from my memory of Bangkok, there are many places to eat there! Its okay the breakfast isn't included coz there are many options in Bangkok. Breakfast would be nice when you stayed in a resort. never heard of this hotel but looks really great for a short stay. I also like Thailand and every time I go there, I find something new to explore! I'm so jealous you were in Bangkok! I'm hoping to go back later this year. I'm liking the simple elegance of this hotel, and it's great that they are trying to be more environmentally friendly with the refillable bottles. I'm going back this March! I've always wanted to visit Thailand! Hopefully someday. Looks like you had a great stay! Thanks dear! Good place for first-timer in Bangkok. Very cool! I would love to visit Thailand. Now you have given me a great place to stay. Thank you Cyndi! I just visited Bangkok last weekend, and will share other hotel options you can try. Great review Blair! I love your 🇹🇭 articles. As I haven't to that wonderful place yet. Loved it, especially the pictures. That's true and their economy is getting even better. wow! looks like a lovely place to stay. I like that you included they speak english as well as thats good to know for foreign travelers. Many hotels in Thailand have multilingual staffs! I really love the design of the hotel and the room so clean and comfortable awesome photos. Thanks Maysz! It was so nice and very convenient. Can’t wait to visit Thailand some day! The hotel looks like an ideal place to stay. That's awesome! I haven't experienced any issue and I feel safe. The hotel looks great and has lovely amenities. I would love to check myself in there. Your captures are great. That will be great Monidipa! I know right! It was a nice place with good neighborhood. Really like the minimalistic hotel. Big fan of those chairs and the abstract art posters. My friend is Thailand so I hope she brings me along to Thai next holiday. Best to visit Thailand during summer! 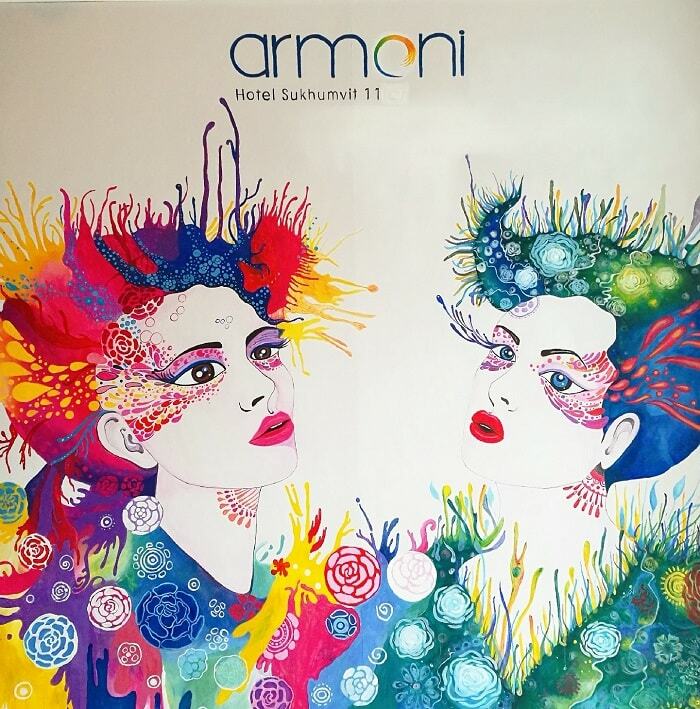 Nice hotel and the art images are so detailed! Can't wait to try it when we visit Thailand! Looks like a great place! Seems clean and appealing to the eye. Your featured photo is lovely with this bright colors! Why are hotel interiors better than our homes? will check on ARMONI when i visit Thailand. thanks for sharing your experience and it is really helpful for them who are planning to visit this place. btw tgis place looks so beautiful. Thailand is my next destination after Cambodia, hope I can make it sooner. Lovely pics and the hotel is fine for the price according to the pics posted. How is your Cambodia trip?! This looks like a simple but really great hotel. I love the mural! Yeah, I am thinking of getting one for my studio room. This hotel is so interesting! I would love to visit here someday. Thank you for sharing! Looks like an awesome hotel. Looks very safe too. I am glad you had the grandest time. Loving your adventures. Please keep them rolling. Yes I plan to do it! 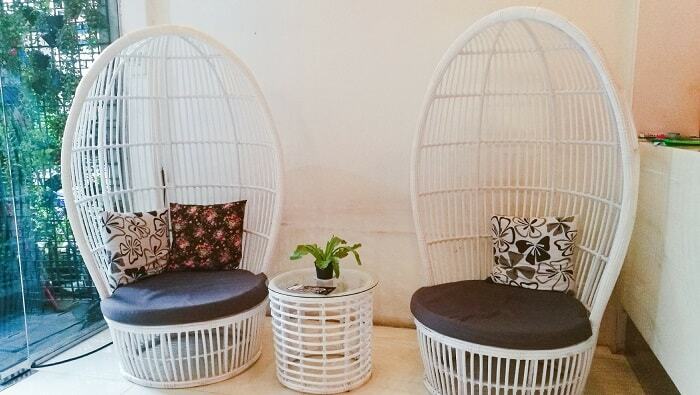 I love those white wicker chairs in the photo! Thailand is on my bucket list. Pics are looking awesome. Hope you enjoyed the trip. Thanks for sharing. Yes I love my whole Thailand trips! This place looks beautiful would love to visit Thailand very soon. Oh you'll definitely like it!